Madame Tussauds is an ever-changing attraction; it’s constantly re-inventing itself to remain current and topical for its audience. However, as one of London’s most popular event venues, how do we communicate this continual update to the big event planners who come to us year on year? For each theme, Prelude Entertainment created 3 portfolios of entertainment, Payne and Gunter created 3 delicious menus and Grey Hare explored theming and floral displays. When the guests RSVP’d through our online studio created by Aparmentwo, they were able to select their favourite theme. One week later, we announced the winning theme, Carnival, and invited guests to vote for cocktails, food and entertainment all via Twitter and Facebook. It was fantastic to see people engage through social media, sharing their ideas and what they had voted for. The buzz was brilliant! On the night what did we end up with? On arrival guests were greeted by Merlin branded builders outside the venue before they set foot into Carnival. Once inside the venue guests received Mardi Gras beads and made their way to our famous A-List Party room, where they sipped on their chosen cocktail and listened to a New Orleans Jazz Trio who they hand picked as reception entertainment. Following the reception guests mingled in Premiere Night and were later shown to the stunning World Stage space. In the World Stage guests visited Carnival street food stations and were wowed by Rio Samba dancers (the evening’s main entertainment) which they had previously selected via social media. Guests mingled and continued to party as plasma’s in the World Stage screened carnivals from around the world. It’s your party didn’t stop here; after all social media is all about sharing your experience. 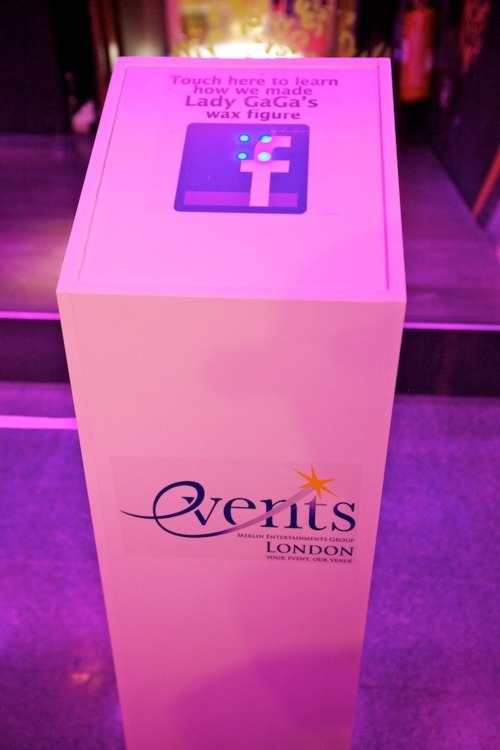 Excellerated Apps visited Madame Tussauds and installed 4 check-in points around the venue for Facebook. Prior to the event, guests were asked to register their details to enable them one touch sharing on the night via Facebook. Guests arrived and picked up a Merlin Event business card with an RFID technology (similar to the Oyster card). THE BEST BIT is that we controlled the content from the stations; we could put out any message and guests could access it once they had checked-in at a station. How many impressions did this create on Facebook?39,423! What have we learned from this experience? Many venues use social media incorrectly (if at all), it’s not just about creating hype about your product, it’s how you share it in a creative manner which will engage with the consumer and encourage them to share your latest news/products/experiences with others. Even with a fully themed venue, you can always create a new experience for your consumer. What’s in Store for Events Marketing in 2016? Celebrate New Year’s Eve In Style!